WILLOUGHBY HILLS, Ohio -- Manakiki Golf Course delivers almost as many ups and downs as the stock market. The cool clubhouse at Manakiki Golf Course frames the 18th green. Elevated tees and greens highlight this hilly Donald Ross design 17 miles east of downtown Cleveland. Shot for shot, the 6,641-yard course might be just as good as Sleepy Hollow Golf Course, widely considered the gem of the eight courses owned and operated by the Cleveland Metroparks. "I've seen it go from being in poor shape the past few years to one of the better courses around," said Kevin Wiese, a resident of Mentor, Ohio, who plays in a weekly league at Manakiki. "It's very challenging. There are no easy holes. It's hilly. There are no flat lies. I love to play it. It's a nice course." The name "Manakiki" is believed to be a Native American word for maple forest. 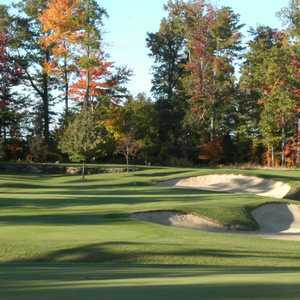 Its background and tree-lined fairways are eerily similar to Sleepy Hollow, designed by another legendary Golden Age architect, Stanley Thompson. Manakiki, dating to 1928, used to be a private club before opening for public play in 1961. In 1990, a master plan was developed to renovate the golf course and restore much of its original character. 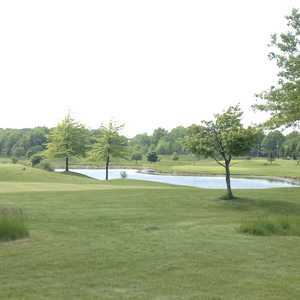 The plan included installing water and irrigation systems, building a pond on the third hole and restoring a pond at no. 15. Tees were rebuilt or restored on holes 6, 8, 9, 13 and 15. The first three tee shots introduce the theme of the day. The first hole climbs uphill. The second hole dips to a valley before turning right for another climb. The third hole falls from the tee box before rising again over the new drainage pond to another tricky green. Back-to-back par 5s at nos. 12 and 13 can be kind or cruel on the back nine. "The course plays longer than the yardage, especially when it's cool," said Tom Kochensparger, the manager/club professional at Manakiki. "There are all kinds of lies out here. There is a lot of great topography." The small Ross greens can be deceptive as well. The 18th green might be the smallest putting surface on a regulation course in greater Cleveland. "They have small undulations," Kochensparger said. "When the speed is up, it looks like the putt breaks two to three inches, and it goes a lot more." The clubhouse is just as historic as the course. The building was originally the summer estate of Howard Hanna, a prominent Cleveland industrialist, before it was expanded into a cool hangout for golfers with high ceilings. The unique Ross Room seats 75 for banquets. There is some repetition to the downhill tee shot, uphill approach shot of Manakiki Golf Course. But let's not nitpick one of the few great public Donald Ross courses still alive and well in the country. This is a timeless treasure well worth the pint-sized greens fees the Metroparks charges to play.